Gyeongsangnam-do, South Korea, Shut down the illegal dog meat farms, slaughterhouses and markets. Home / Blog / Gyeongsangnam-do, South Korea, Shut down the illegal dog meat farms, slaughterhouses and markets. In Gyeongsangnam-do, there are countless dog farms, slaughterhouses, markets and restaurants where the dogs, who are tortured their entire lives, end up being slaughtered in the most inhumane ways, such as by electrocution, hanging or beating; and then thrown into boiling water – sometimes while they are still alive. In many places, dogs are being killed in full view of other terrified, caged dogs; and this takes place in broad daylight. In addition, many abandoned and stolen former pets end up in this industry, and are subjected to the same cruelty. 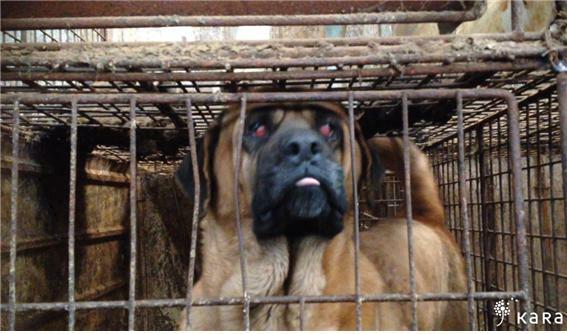 A Search Engine reveals the sickening scale of Gyeongsangnam-do’s dog meat demand. The searches resulted in: 1,007 Health Food Shops; and 255 dog meat restaurants in and around Gyeongsangnam-do. Even if half of these ‘Health’ Food Shops and restaurants serve dog and cat ‘ingredients’ in one form or another, just imagine how many dog/cat slaughterhouses must be present in and around Gyeongsangnam-do in order to supply all of these outlets. Please sign petition, call, write and email the Gyeongsangnam-do Governor and the Provincial Council TODAY! Subject: Gyeongsangnam-do, South Korea, Shut down the illegal dog meat farms, slaughterhouses and markets. Petition: Gyeongsangnam-do, South Korea, Shut down the illegal dog meat farms, slaughterhouses and markets. These inhumane meat farms must stop! What kind of country does this? VERY uncivilized!! The illegal dog meat trade in South Korea is a tragedy for innocent animal who are truly men and women’s friends and loyal protectors. There are many ways to eat protein that do not involve torture and pain for sentient beings. This use of dogs is a terrible situation that must be protested by caring people. For without humans to protect them, the dogs do not have a chance to be treated with respect and will continue to be treated like objects This is morally wrong and what goes around will come around . I am writing to you as your beautiful country has a long history of culture – which is respected throughout the world. The traditional of breeding animals particularly ‘ Cats & Dogs ‘ isn’t necessary in these times because alternative food is plentyful and more varied. The conditions that the animals are breed in and looked after is barbaric and cruel, the animals suffer horrific deaths. They are living creatures too , just like you and me . If you want your country to once again be remembered for its history and not its brutality then the practice of eating ‘ Cats and Dogs ‘ must stop. My families and friends enjoy travelling but will continue to boycott your country until something is done. 4I despise the horrendis discusting ways that they torture and slaughter animals. These poor dogs and cats beautiful caring loving animals who suffer such horrendis pain and suffering. This has to STOP NOW!!! This is why I would never buy a Korean made vehicle or anything made in Korea, until they change this. BAN THE SICK EVIL DOGS AND CATS MEAT !! !